One of the things we’re passionate about at Bosinver is supporting local artists and craftspeople. Each of our cottages is individually designed, and Pat is always on the hunt for unique, handmade pieces to add the finishing touches. 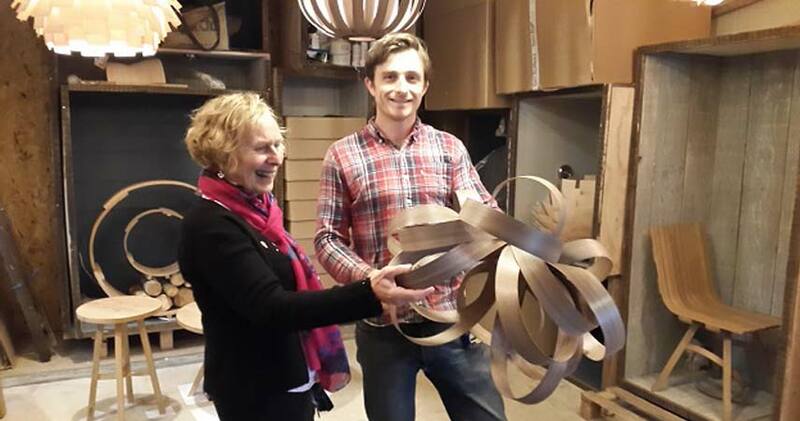 Her search often takes her to some far-flung or tucked away spots across Cornwall, as it did last week when she went to visit designer Tom Raffield in his studio. I achieved a personal ambition recently down in the wintry woods at Trevarno near Helston where I managed to navigate my way to Nanskerris, the hiding place of the young, talented carpenter and designer, Tom Raffield. I bought one of his lampshades to hang in our eco house, Lowen. I have long coveted these magnificent objects which celebrate style, design and craftsmanship but I wanted to meet the maker and tell his story to celebrate his contribution to the amazing range of quality products being produced right here in Cornwall. Tom grew up on Exmoor, surrounded by natural beauty which stimulated his imagination and inspired freedom to be adventurous in his designs. He trained at Falmouth College of Arts (now Falmouth University) where he was fascinated with the practice of steam bending which he since developed to allow the complex 3D bending that his designs required. He then moved to Trevarno where he lives and works in his seven acres of woods, designing and making a range of contemporary furniture and lighting in a sustainable way, seeking a solution to the throwaway culture omnipresent in many of our lives. Tom believes that every piece of lighting and furniture in his range must be beautiful in form and practical in function, designed to last a lifetime to become antiques of the future. The wood is sourced as locally as possible from sustainably managed woodlands, air dried or green. Steam bending requires relatively little energy, is low wastage without the use of toxic chemicals, just water, and any wood waste is used in the composting toilet. Tom employs a local workforce and uses local suppliers, all of which add up to some amazingly green credentials, which I rejoice and admire. It was wonderful to meet Tom and his team in their woodland hideaway, beavering away with pride and passion to create amazing works of art without costing the earth or destroying the planet. It makes my heart sing and I never cease to be inspired by the wealth of talent we have around us in Cornwall, inspired by the landscape the light, nature and the people who call it their home.